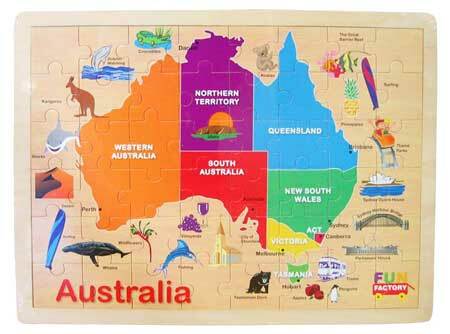 Large Wooden Discover Australia Puzzle is a forty eight piece educational puzzle featuring a map of Australia and all its States and Territories. The Australia map puzzle details each states capital and has pictures of things unique to each area, like Melbournes trams, The Northern Territories Uluru and many many more. A well thought out puzzle with a high educational value that little ones will really enjoy. The puzzle is surrounded by a wooden frame which all the pieces fit neatly into. Material: Wood with wipe clean surface. We like this because: "lots to look at and discover a lovely size. A great puzzle. "